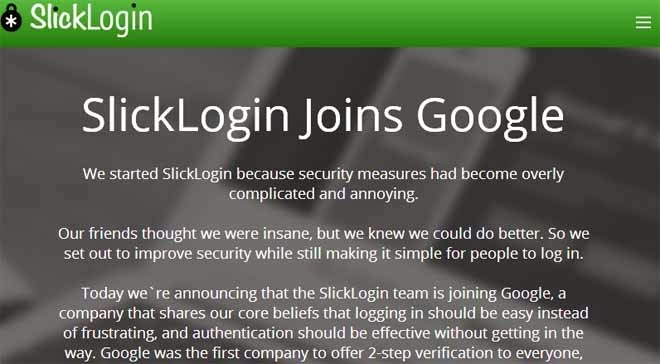 Google acquired today Israeli startup company SlickLogin. Five months ago, the company made its debut on the internet password security scene offering an interesting alternative – sound-based passwords. The announcement of the acquisition sits on the company’s homepage, where the small team says that now they’ll be making the Internet safer for everyone. Presumably, Google has decided to replace its 2-step verification with a better authentication method. The concept behind SlickLogin’s product is to use a nearly-silent sound played through the computer’s speaker, which gets picked up by an app on your smartphone – it analyses it and sends it back to the service. In the end, this two-way communication between your PC and smartphone is what authenticates you and it seems the concept seems secure enough to have tickled Google’s attention. The service that SlickLogin is offering can be used as a password replacement or as a part of a two-step verification process. We’re yet to see how Google will implement the technology into its products. Further details regarding the acquisition details haven’t been disclosed at this time.